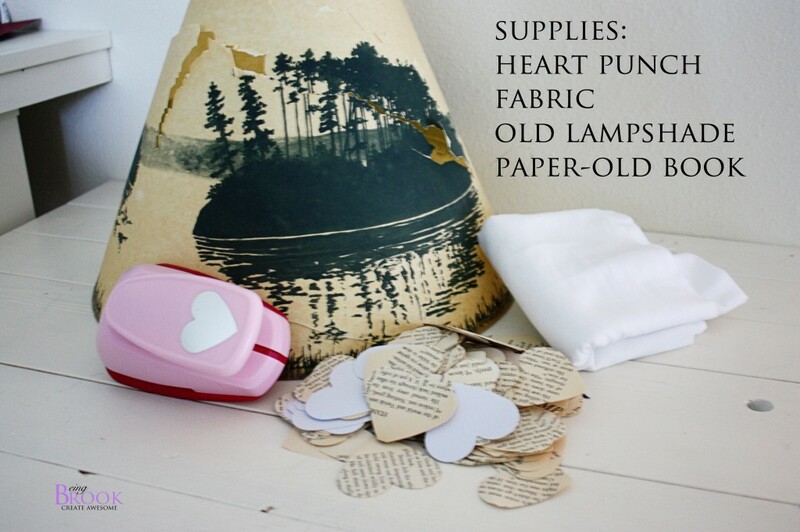 I've been working on cleaning out my sewing/craft room the past few weeks. My biggest problem is that as soon as I get stuff cleaned up a little I find something that others would classify as trash and have to turn it into something fun! Today I'm going to show you how I made a heart mobile out of an old lampshade and a thrifted book. 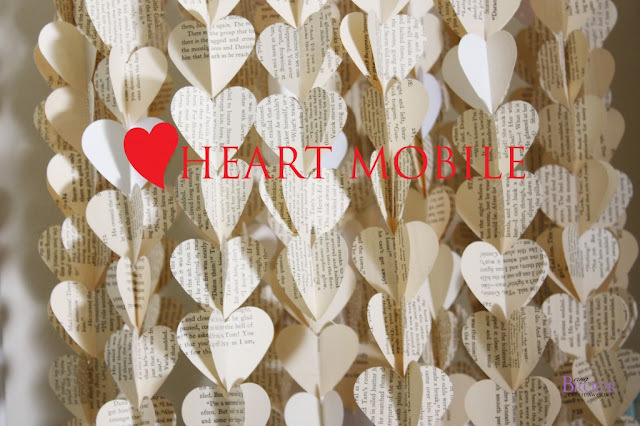 Love how cheerful and fun the mobile is plus it was way more fun to spend time making the heart mobile then cleaning. 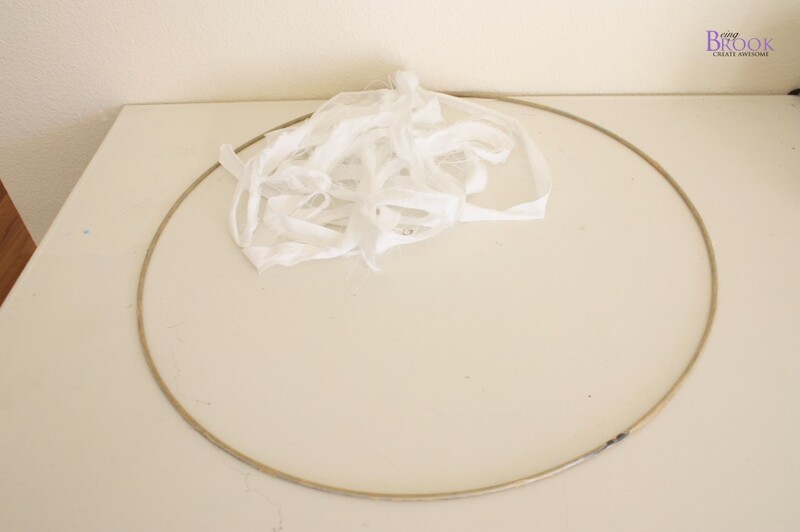 Old lamp shade or something else circular like an embroidery hoop. My shade was purchased at Goodwill for $3 and I was going to recover it but the poor shade didn't survive it's time on the garage shelf thanks to my wild boys. 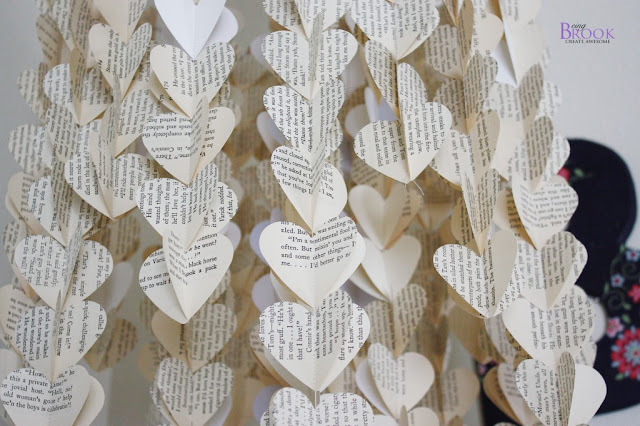 Punch out a bunch of hearts or have your kids punch them out and count it as family fun! Then start sewing them together. 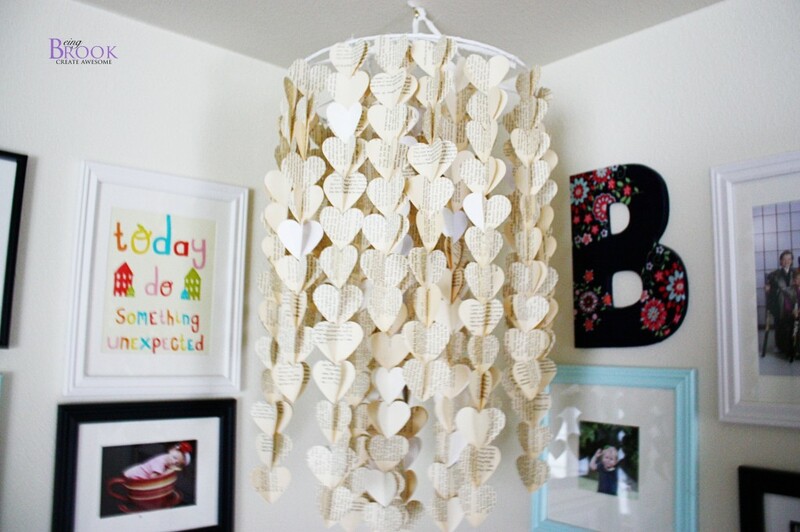 Before sewing each section of hearts together pull the thread from your machine out about 10 inches so you have a string at the top to tie to the lamp shade. 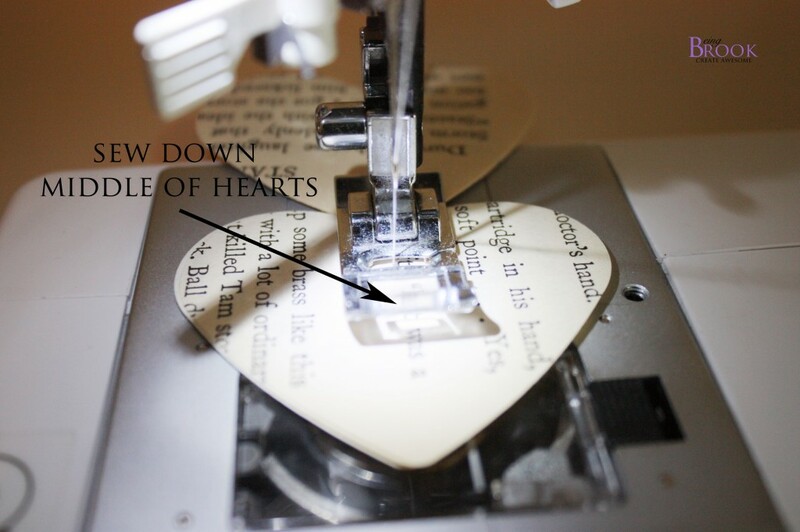 Take two hearts and put them together and sew down the middle of them. I backstitched on the very first heart and on the very last heart. 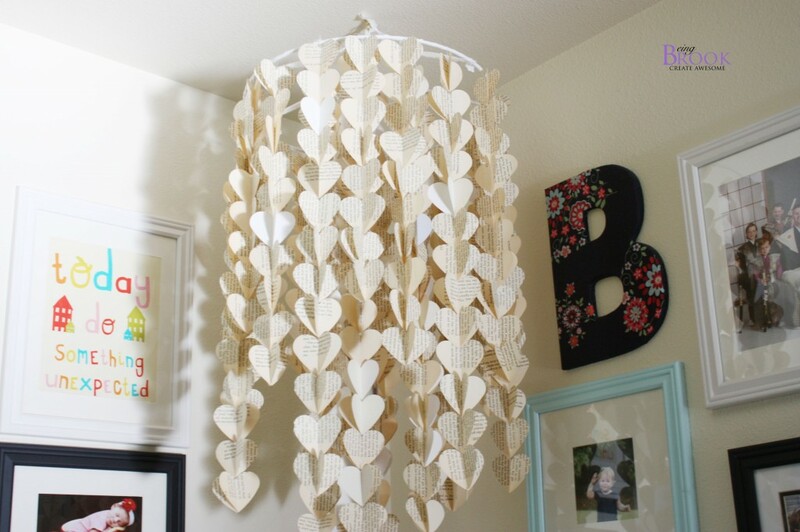 Take the paper off your shade and you will have one large metal hoop and one small metal hoop. Cut your fabric into a 1/2 inch strip or use some ribbon. 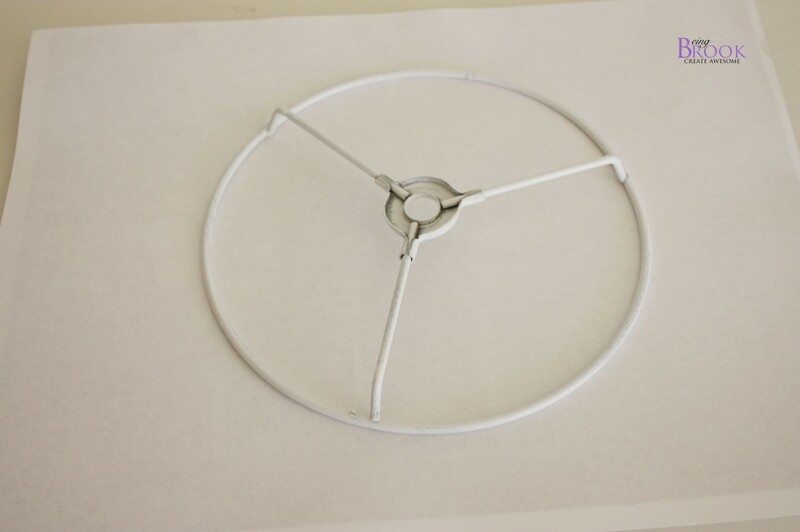 I spray painted the top hoop white so the parts not covered with fabric would still be white. 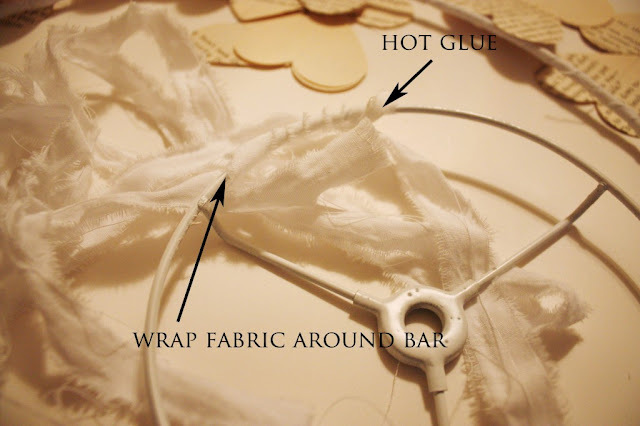 Hot glue and then wrap your fabric around the hoops. 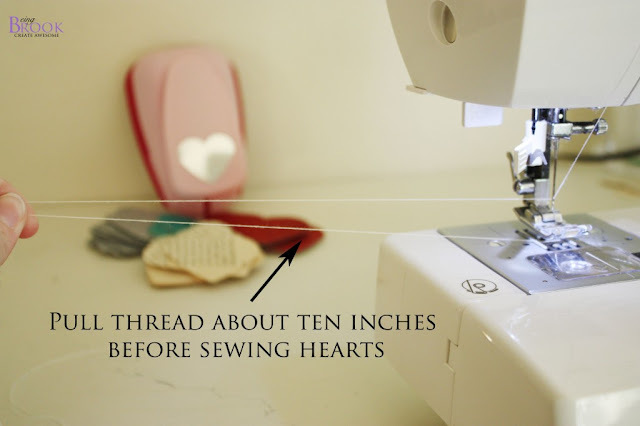 Tie all your hearts on with the 10 inches of thread you left on to top when sewing. 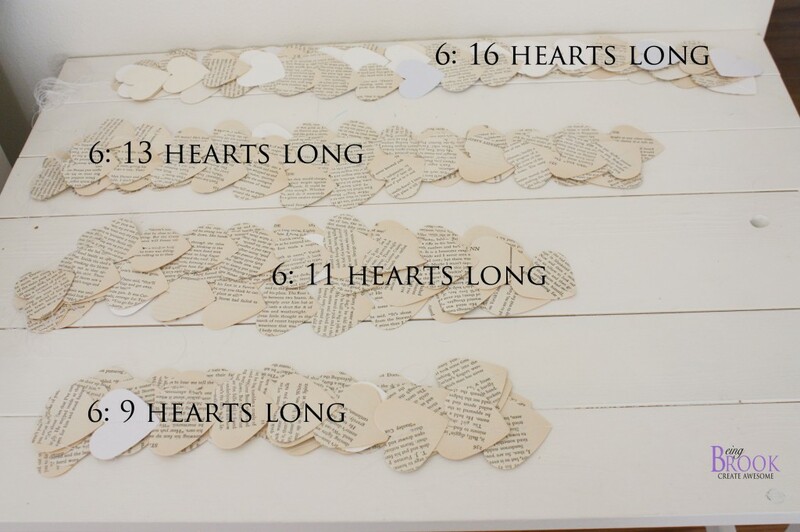 I put the 15 heart sections in the middle and then alternated around the edges 9 heart, 11 heart, 13 heart. 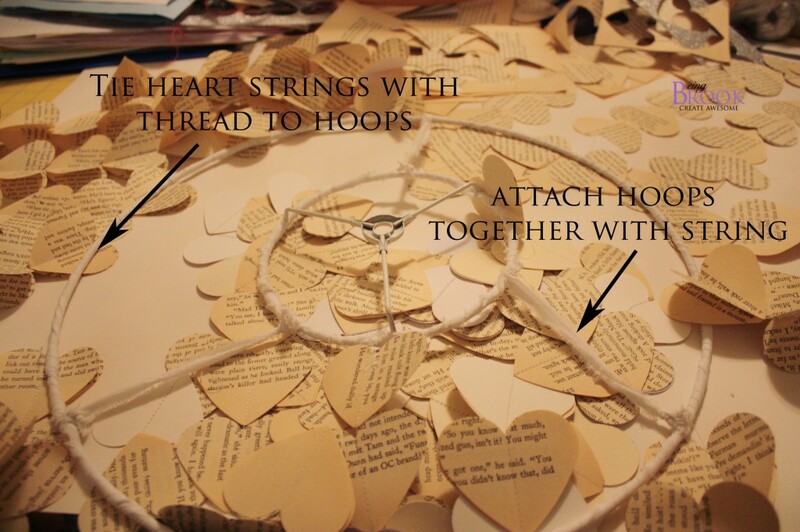 Tie the middle hoop to outside hoop with a few pieces of ribbon or string. 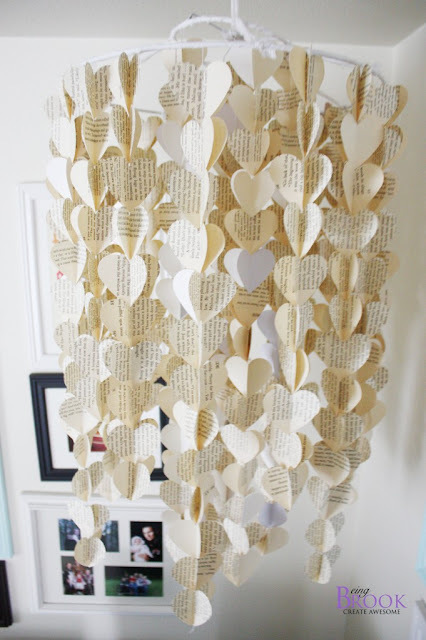 You could even use strong fishing line if you didn't want to see it. 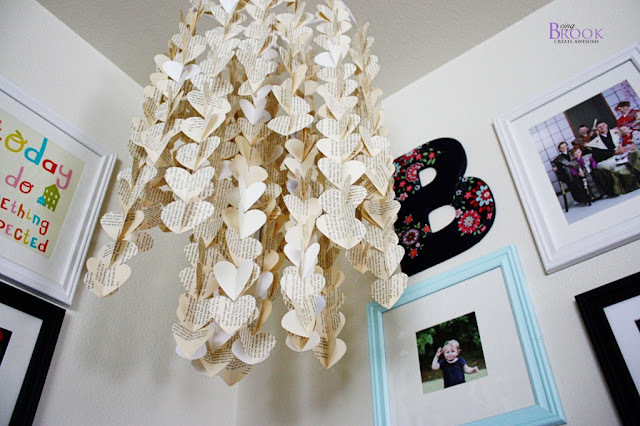 Attach a string in the middle for hanging. Once my mobile was hung up I folded all the hearts open to give them the 3D effect. 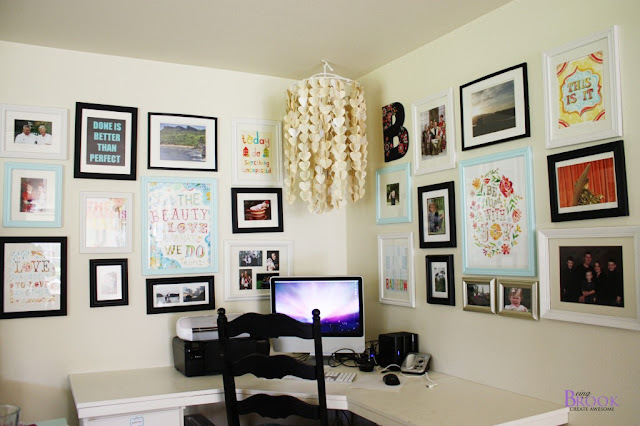 I had this empty spot in the corner of my desk that seemed lonely so I hung my mobile there. Love it! 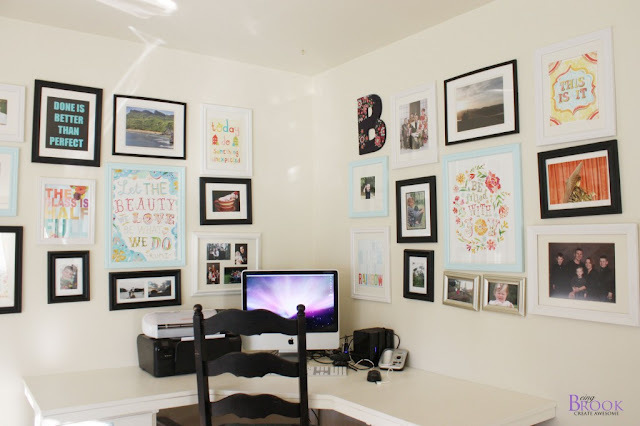 It goes perfectly with my cheerful wall display. Today you get a lot of pictures because I just couldn't pick a favorite! 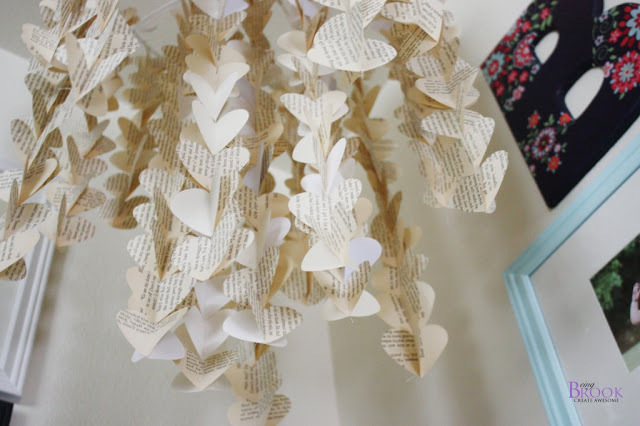 Have you made anything out of trash lately?